PONY RYDER: Anna, you won a modeling contest on a Dutch television station. What show was it? ANNA DE RIJK: It was a co-operation between a celebrity magazine, TMF (Dutch music channel), L'Oreal and Paparazzi (my mother agency). PONY RYDER: Has that affected your career? ANNA DE RIJK: It was good to get a bit of a start in Holland, but it didn't mean anything internationally. Also I was still in school back then and just wanted to finish first. PONY RYDER: You reached stardom this year! What lead you to your success, was there a specific point in your career that made all the difference? ANNA DE RIJK: Haha yes, this year everything has been different. It started with shows in London. Russel Marsh scouted me for a lot of his shows. I think he's really to blame for it all. Because doing well in London I also did good in the cities after and of course doing Prada and Miu Miu was a big boost. PONY RYDER: What do you think that the new girls have to be aware of? ANNA DE RIJK: Well, I think they should maybe make sure they don't get walked over. To listen to yourself and know what is enough. You have to stand strong. PONY RYDER:A cool personality is just as important as good looks in this business, if not more. Has your personality changed since you started? ANNA DE RIJK: haha I hope not.. Would be strange to have a different personality all of a sudden. I do think I’ve changed but more in the sense of growing up and knowing who I am. 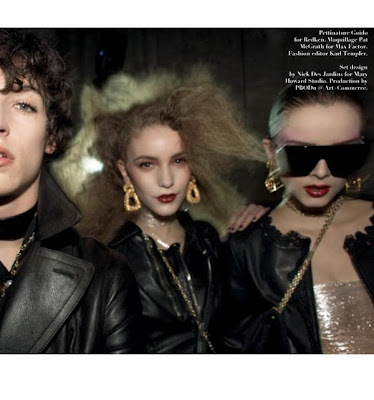 PONY RYDER: Can you tell us about the day that you found out that you got the Prada campaign? Who told you the news? PONY RYDER: How do you get along with other girls from the campaign? Did you meet all of them on the day of the shoot, or have you met them before? ANNA DE RIJK: I knew all of them before, except Julia. All of them are really nice. PONY RYDER: Those boots that you are wearing on the Prada ad are excellent! Would you wear them yourself? ANNA DE RIJK: Yes, Yes!! I like them so much! I love rain boots and these are also very cool and beautiful, I would wear them a lot..
PONY RYDER: What was the best goodie bag present that you got? PONY RYDER: Do you own any High Fashion style items? ANNA DE RIJK: I'm wearing an Alexander Wang jumpsuit right now. It marmered black and white, pretty wide. Really cool. PONY RYDER: When is the stress bigger, when you are doing couture or ready to wear? ANNA DE RIJK: Ready to wear! Because there are much more shows! So many castings… So many fashion weeks. What really makes it stressful is when I can't have a break. Because couture was not so busy for me I had loads of breaks. PONY RYDER: Are castings for couture different than castings for ready to wear? ANNA DE RIJK: Haha, yes, well.. I guess it's very important you are dressed a bit chic and wear high heels and everything.. Only, I had a bit of a problem.. I came straight from a job in London and because I was supposed to go home to Amsterdam in between, I didn't have any casting clothes on me. Just one outfit..
My booker called me „the English country girl“.. It was a brownish flower dress with flat green laced boots. Not exactly a couture casting outfit. It didn't matter much in the end. I'm very happy with the shows I did. PONY RYDER: Do you always have a pair of high heels with you? Which shoes are your favorite „casting shoes“? PONY RYDER: When you have castings all day, do you manage to eat at all? ANNA DE RIJK: Yes, always. If there is no time I just run into a supermarket and get supplies to eat in the car. I love nuts and dried fruit as an easy snack. PONY RYDER: What was your favorite couture show? 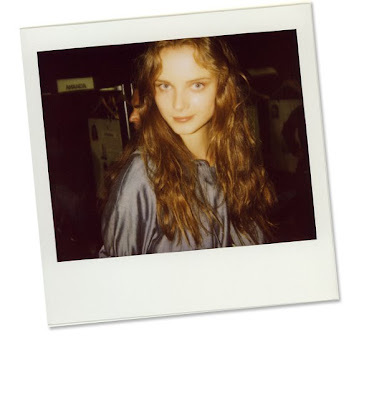 ANNA DE RIJK: Chanel. It was my first and it was very beautiful. It was a bit like „ah yes, this is what I would think a show would be like without ever doing one“. Very glamorous, super beautiful clothes and care to the whole show. PONY RYDER: Did you take a sneak peek on who was sitting in the front row? Who did you see? PONY RYDER: What do you like about fashion week and couture shows in Paris? Is it different from other fashion capitals? ANNA DE RIJK: The fashion brands in Paris are so ancient, they are really the big fashion houses. And there was fashion.. So Paris has a bit of back-in-time mood to me. The whole city, it's culture, the Parisians and the way they dress, it is also very classic and conservative. PONY RYDER: Did you discover any good places to eat in Paris? ANNA DE RIJK: I eat a lot at Livingstone in Rue Saint Honore. It's Thai food, but very very good Thai food. I really don't like French cuisine. I find it boring and greasy. PONY RYDER: The Best Café In Paris? ANNA DE RIJK: Walking, eating healthy, enjoying life, doing things that make me happy. And.. a bit of bikram yoga. PONY RYDER: Did you always have a perfect body, or did you have to work for it? ANNA DE RIJK: What is the perfect body... Not sure whether me or anyone has that. I've always been slim but have to work more for it now then when I was 16..
ANNA DE RIJK: I almost always have fruit and then the next thing changes. Sometimes oatmeal or granola or omelet and toast. PONY RYDER: Which brand of cereals is your favorite? ANNA DE RIJK: No favorite brands. Especially in New York. There’s absurd loads of choice so I try all of them. PONY RYDER: Do you ever stop at Fast Food restaurants? PONY RYDER: How do you maintain yours skin? ANNA DE RIJK: I clean every morning and evening and take masks (from Lush) sometimes. PONY RYDER: What moisturizer is your favorite? 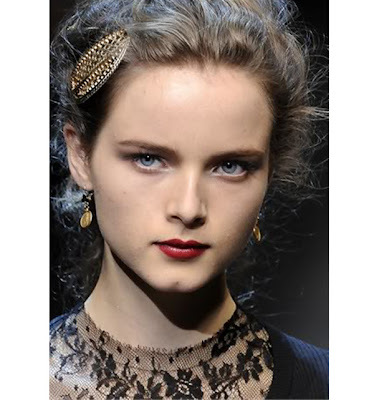 ANNA DE RIJK: Chanel mascara and eyeshadow. PONY RYDER: Which magazine is in your bag? ANNA DE RIJK: Acne Paper.